The Red Lodge was built in the gardens and orchards of the Great House – now the site of Colston Hall. The gardens would have sloped downhill towards the big house. Following a restoration in the 1980’s, the garden was redesigned to suggest how it might have looked when the house was built. 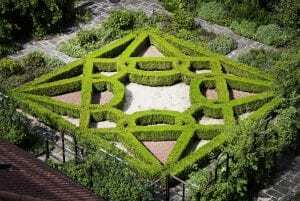 Wooden fencing or trellis made to a 17th century design encloses the garden which is laid out with low hedges in an Elizabethan knot garden pattern. The design was taken from the plasterwork on the ceiling of the master bedroom, which also offers a great view of the garden itself. Guests would have entered the house from the knot garden over 400 years ago.